Stines" on the Burn! Blog. Read the story here. 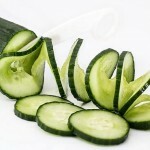 Peel the cucumbers, slice them in half length-wise, and use a melon baller or teaspoon to scrape out the seeds. 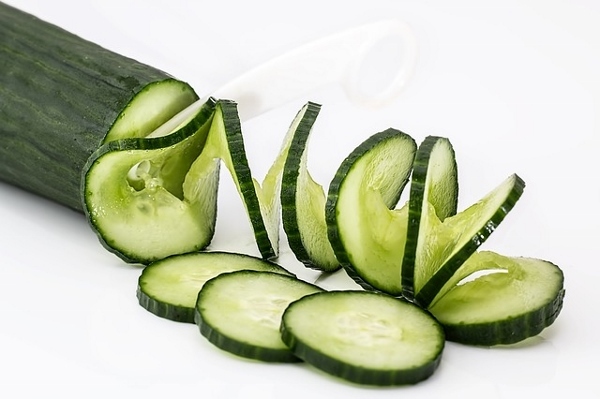 Slice the cucumbers into 1/4-inch slices and place them in a colander. Sprinkle the cucumbers with one tablespoon of kosher salt and allow them to drain at least one hour. Salting the cucumbers will draw out some of the moisture, making for a crisper salad. Meanwhile, stir together the remaining salt, rice wine vinegar, and water in a small bowl. Rinse the cucumbers and drain them well. In a medium mixing bowl, combine the cucumbers, scallions, chilies and red onion. Add the rice wine marinade and stir it all to incorporate. Refrigerate the mixture for at least one hour. Garnish it with the basil and serve.